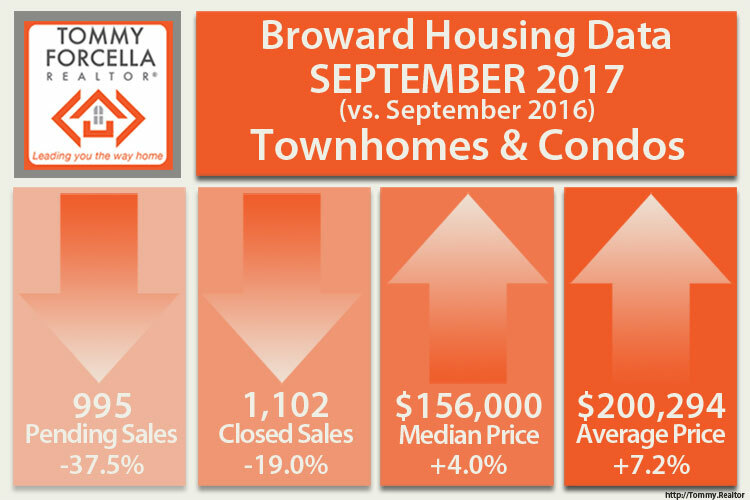 Hurricane Irma hit South Florida on September 11th, and all market activity ceased for the remainder of the month. Closed Sales and New Pending Sale listings dropped dramatically and were extended to at least October. While damage to housing was not reported as extensive, widespread tree canopy debris and lack of power resulted in these delays. 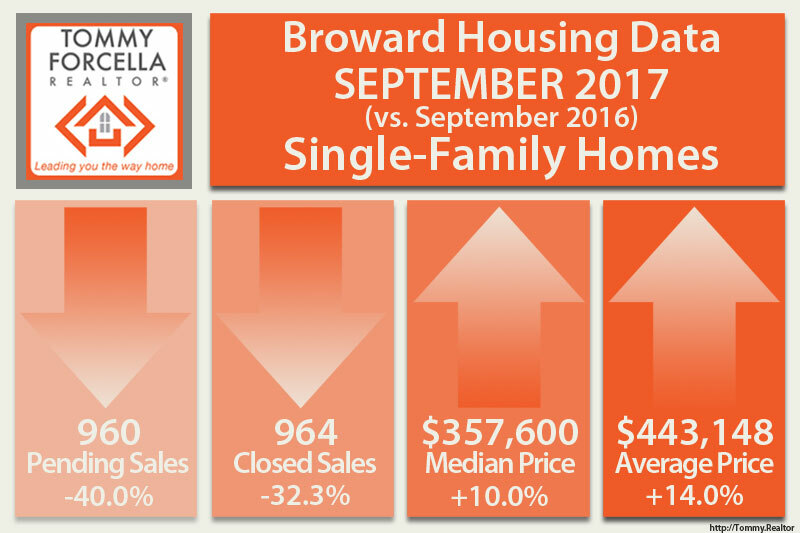 Demand for single family homes is still strong, which is apparent in both the increase in prices as well as Time to Contract. Time to contract is still decreasing, with a typical home under contract in 36 days. This has been the average time to contract since April 2017. Inventory levels are still lower than 2016, with only a 3.8 month supply of single family homes. Sellers that intended to list their home in September but did not due to the storm, could delay their decision by 1 month or more. Many neighborhoods (such as Plantation) still have not removed all the tree canopy debris cluttering neighborhood streets. It’s not an optimum environment to market a home. 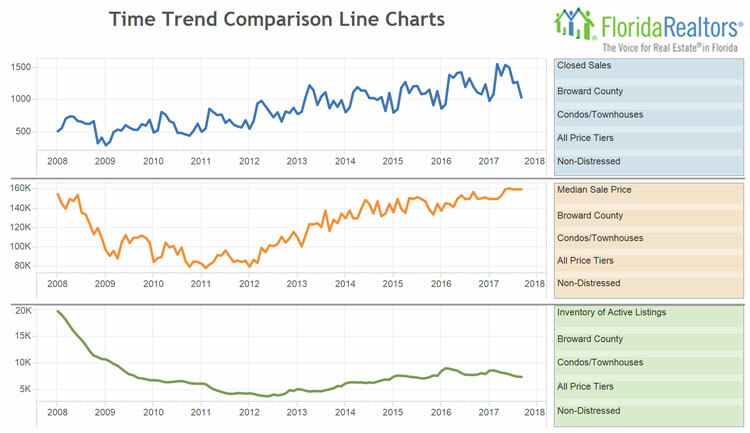 Median Prices for condos and townhouses in Broward County have been between $156,000 and $160,000 since May 2017. Time to contract is 51 days on average, a week less than in previous months. The condo-townhouse market is balance with 5.6 months of supply of inventory. MSI is a useful indicator of market conditions. The benchmark for a balanced market (favoring neither buyer nor seller) is 5.5 months of inventory. Anything higher is traditionally a buyers’ market, and anything lower is a sellers’ market. For the past 18 months, the percentage of distressed property sales as declined sharply. Short-sales properties are now (thankfully) a rare commodity. 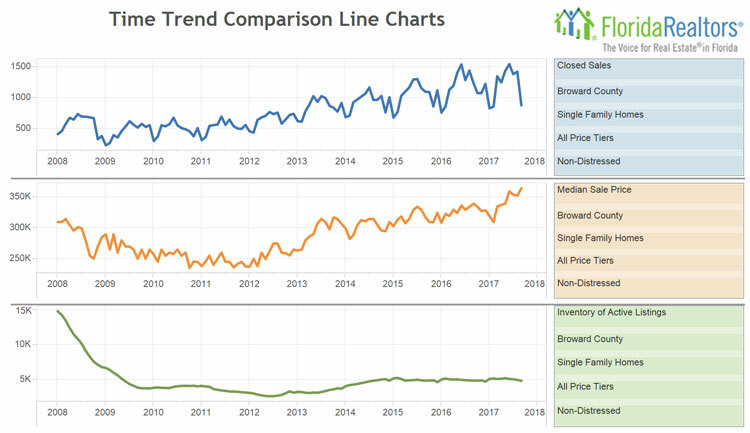 Broward County Foreclosures are at a 10-year low, and only represent about 100 sales each month for all property types. In another 4-months time, I believe year-over-year comparisons will improve as they start reflecting this year long reduction pattern. Statistics for each month compiled from MLS feeds on the 15th day of the following month. Data released on Friday, October 20, 2017. Next data release is Tuesday, November 21, 2017. Previous What is Property Tax Portability?